Posted January 9, 2007 in 2007/01, 3 Timely, Assorted, Early Jack Kirby, Periods, Serial Posts, z Archive. October (cover date) was a relatively slow time for Jack Kirby. The only full comic story that Jack drew was for Blue Bolt. As we saw Jack had been doing all the penciling for Blue Bolt starting with issue #4. The October story for Blue Bolt was issue #5, the first comic that had a Simon and Kirby credit line. Also to come out in October was Famous Funnies #75. However the art for Lightin’ and the Lone Rider may actually have been done sometime earlier. Even if it was done at the same time as Blue Bolt #5, it is only two pages. 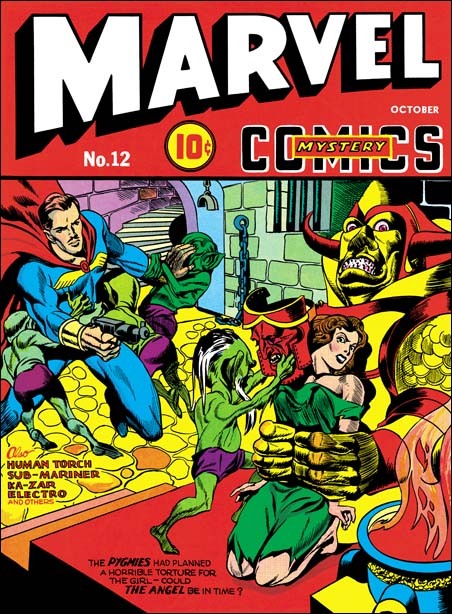 The only other work Jack produced for October was the cover for Marvel Mystery #12. This was Kirby’s fifth comic book cover. Some of his earlier covers (Champions #9, Red Raven #1 and Daring Mystery #6) contain a certain awkward quality. But with Marvel Mystery #12 Jack has arrived to a cover style which he would use quite successfully later with Captain America. The hero for this cover, the Angel, is one of the backup features for this title. Judging from the covers it is not clear how much of a backup the Angel really was originally meant to be. The Angel had appeared on four of the previous eleven covers. Kirby’s Angel cover would be that hero’s last for the title with future Marvel Mystery covers exclusively by either the Human Torch, the Sub-Mariner, or most frequently both of them. Unfortunately Jack Kirby would never draw an Angel story. Judging from this cover I suspect that if he had it would have been an interesting read. As was typical in Simon and Kirby covers, the hero arrives just at the critical time. He plows through his diminutive green advisories, shoving one of them in the face in a manner similar to that used for the cover of Champion Comics #10 (see Early Jack Kirby, Chapter 5). The Angel does not use the gun on his most immediate foes. Instead the hero reserves it for saving the beautiful victim, as the blurb says “could the Angel be in time”? Exactly what is going to happen to the woman is not completely clear. A first glance it looks like nothing more then that a mask will be placed on her. On closer look the mask has a strap with a sort of bolt attached. This suggests that the mask will be more then just worn, her face will be forced into the mask. Will this result in some sort of transformation? We may not know what will happen, but the lady seems to have some sort of idea as she squirms away trying to avoid her fate. The victim is unable to move very far as she is being held tightly by two gigantic hands. The hands might seem to belong to a statue, but the color and glint of the eyes, as well as the open mouth, convinces me that this is some monstrous being in league with the little green men. This cover effectively does what it is meant to do, perk the interest of the perspective buyer. The cover is not meant to provide all the answers, but unfortunately the Angel feature inside is a completely different story so questions about exactly what is going on can never be cleared. The cover has some props that would be stock features for many Simon and Kirby covers. 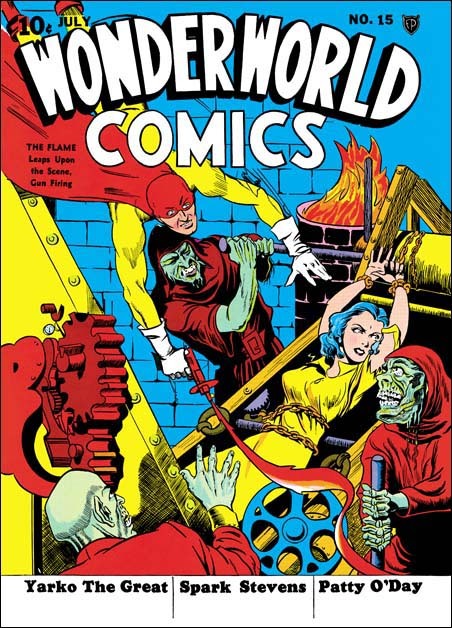 The vessel with an open fire in the lower right goes back to some of the covers that Joe Simon did for Fox Comics such as Wonderworld #15 (see above). The chains hanging from the wall can be traced back to Silver Streak Comics #2 one of Joe’s first cover work. The barred window would be used repeatedly in the future. The descending staircase leading into the room would also often show up again. For November Jack Kirby penciled a new feature, the Vision. This feature would appear as one of the backup stories in Marvel Mystery. Up to now this was one of the few successful features launched with Jack’s involvement. Jack had be penciling Blue Bolt but that had been started by Joe Simon alone. The Red Raven, a feature started while Joe was editor at Timely, was not only short lived but also assigned to another artist. Jack was involved with Marvel Boy who premiered in Daring Mystery #6, but that hero would only reappear one further time in 1943. The only other ongoing comic feature that Jack started was the Solar Legion for Crash Comics see Early Jack Kirby, Chapter 3. the Solar Legion did last five issues, with the first three stories done by Jack. The Vision would be longer lasting and Jack would be involved in it throughout his stay at Timely. The Vision is an odd sort of superhero. He was initially brought forth as a scientific attempt to reach the supernatural world. Once this was done, the Vision was then able to appear and disappear from smoke of any kind. This power is reminiscent of the Flame, a Fox hero that could teleport using any fire as a portal. Not only was Joe Simon previously an editor at Fox but he did several covers of the Flame (see Wonderworld #15 above). 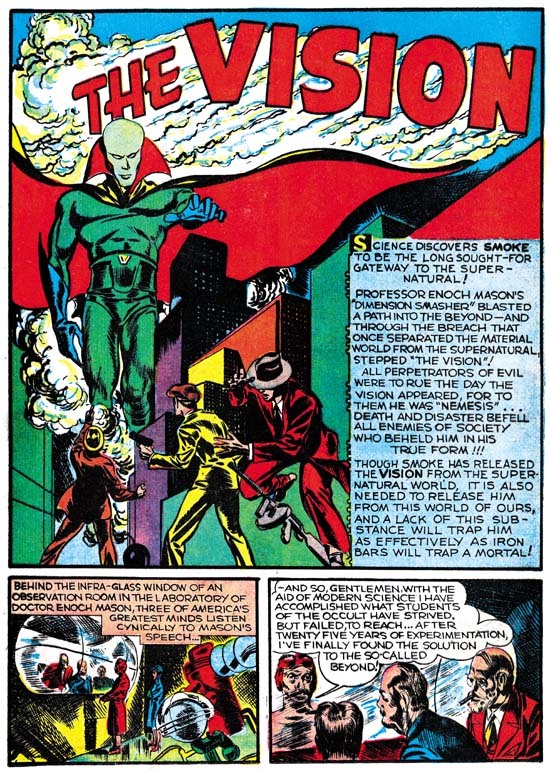 Although normally residing in another dimension, the Vision also had a secret mortal identity. It is I Aarkus in material shape. Only those approaching death can see me in my true form as the Vision! This despite the fact that his “unmaterial shape” had been seen by others who were not facing his retribution. However if you are willing to accept some logical inconsistencies the Vision stories are rather good. As with the cover for Marvel Mystery #12, Simon and Kirby has fully arrived at a story telling style that would shortly bring them fame with Captain America. 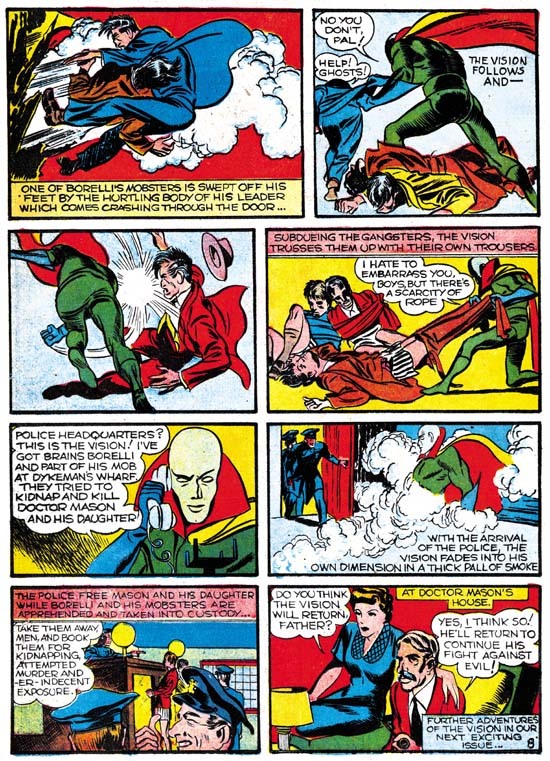 We have seen that Marvel Boy had some features that would later be the used for Captain America; parts of the costume and the fight against spies. One would think that the Vision was so different from Captain America that we would find little in common. But there are a couple of ideas related to the hero’s origin that were carried over from the Vision to Cap. In both witnesses are gathered to observe an experiment being held in a separate lab. Also common is that the experiment is disrupted at a critical time; by criminal thugs in the Vision and by a gun carrying spy in Captain America. I wish I could present further Vision features. Although short in length they have lots of interest both in their stories and as showcases for Jack Kirby’s development during a critical time in his career. Marvel has been publishing Marvel Mystery Comics reprint volumes. But if they keep to their pattern of four issues per volume it will not be until the fifth volume before any will include Vision stories. I do have scans of two other Vision stories but they both are from the end of Simon and Kirby’s stay at Timely. This is not the correct point to discuss them. I will not be including Captain America in this serial post of Early Jack Kirby, that is a topic that requires much preparation and will have to be subject of a future serial post. So I have decided that perhaps the best thing would be to write the two other Vision stories as Featured Stories after I finish up this Early Jack Kirby serial post. So stay tuned.